There’s something utterly nostalgic about knitted dolls – a reminder of a time when toys and life were simpler. Huglees are a bunch of friendly, knitted, characters that have just been launched by an Australian mum. Renae was keen to find reasonably priced, washable and safe knitted dolls for her son, but when her search came up fruitless, it was time to whip out the knitting needles! 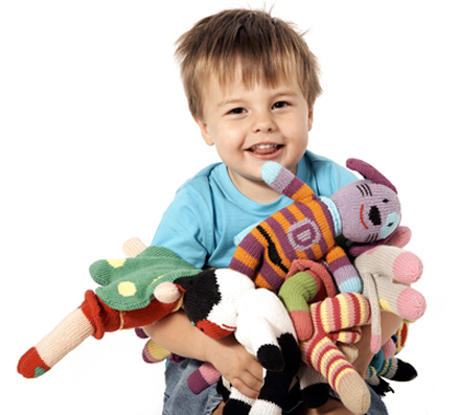 The dolls come in a range of cute and cuddly creatures, from Bella the Butterfly to Mr Maxiboy the Cheeky Monkey. There’s a doll for just about every child’s taste, with an adorable, signature love heart knitted onto the foot of each toy. The nifty knits are suitable from birth, made from one hundred per cent cotton, tested to Australian Safety Standards, and are washable. Huglees range from $24.95 to $29.95, and are currently only available from the website.